In the U.S., lighting accounts for about 20 percent of the average household's energy bill, and residential lighting is undergoing a rapid transition to increased energy efficiency. 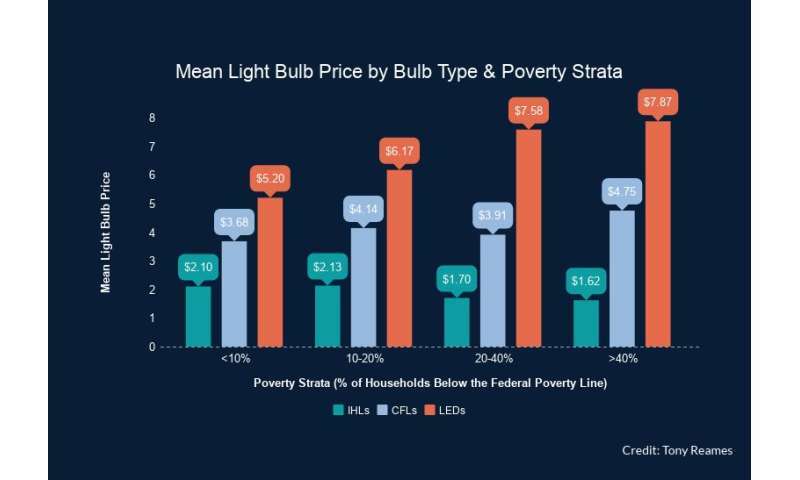 But for many households—especially the poor—the upfront costs of upgrading from an incandescent or halogen bulb to more efficient compact fluorescent lamps or LEDs is a significant barrier, the researchers say. There's a saying, the poor can't afford the cheap. The cheaper LED products have atrociously poor quality. The larger chain stores push these bad products at cheap prices, because the richer people buy them, try them, and then throw them away to buy the better ones. The smaller local markets and corner shops simply don't buy these junk products because they can't cheat their customers without consequences. The cheap LEDs blink/strobe, they overheat, they break down, they have very poor color, and they dim out relatively quickly if they did produce the promised amount of lumens in the first place. Every sort of cheating is going on, like quoting bulb lifetime based on the L50 limit instead of the L70 limit, pretending that the bulb is an "indicator" or "decorative" light for testing. That means the bulb loses 30% of its light output (efficiency) in a year or two while the packet says something like 15,000 hours (5 years).